I’ve had a couple of conversations recently about how hard it is to meet men. Where do you go? It’s pretty much impossible to have a conversation in a bar. Online dating is like looking for a needle in haystack. I already know all of my friends friends, although I could go to the friends friends friends level. At one point I thought I might meet a man in the elevators of my office building. There was this really cute guy I’d see often who would smile at me. Then one day I saw him in a restaurant with his girlfriend and realized he’s just an elevator flirt. Both of the friends I talked to about this had already come to the conclusion that the only place to meet a man is the grocery store. There are some rules to keep in mind though. A man in a big grocery store in the burbs is most likely already in a relationship; small urban markets are the way to go. There is nothing to talk about in the canned soup aisle other than the amount of sodium in the cans; if you spot a cute guy there try and catch him again in the beer aisle. A man who only has beer and chips in his cart might be fun, but ultimately I believe the relationship would be unsatisfying. The best spot to meet a man in the grocery store is the produce section. You can discuss weird looking greens, how to pick a ripe fruit, and if your lucky melons might get squeezed. 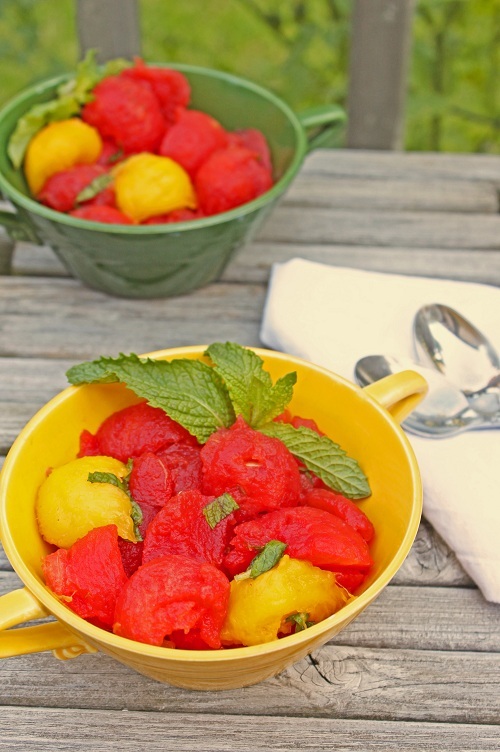 And that brings me to the recipe part of this post; watermelon salad. I considered doing a savoury version, as that seems to be the trend these days, but to me watermelon is a sweet treat to enjoy at the end of a long hot day. It’s Watermelon is quite sweet on its own so I used just a bit of honey to sweeten the salad and a little rum to make it extra delicious (booze always makes dessert better). Using a melon baller, scoop out the watermelon and the mangoes into a medium bowl. In a glass, mix the lime juice, honey and rum together. Pour the line mixture over the fruit and toss with the mint. Meeting a guy in a grocery store as a foodie would be a bonus I think, LOL! Love your salad, and it looks soooo beautiful! 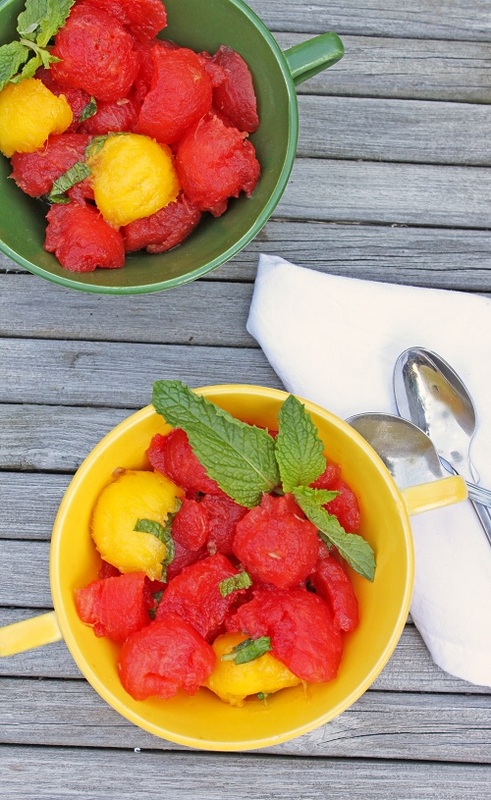 I just adore watermelon as a sweet and savory dish. Oh, my! Am I the only one left who hasn’t done something summery? Thank you for the wonderful reminder, Lynn ;-). What a vibrant salad! First, I love this salad!! The rum is an awesome addition, and I’m loving the mango as well!! Absolutely idea for a summer treat. The rest of the post had me laughing out loud. While I may not always be thrilled with every day of my marriage, I’m thankful not to be “looking”. You had me laughing out loud! I think you are right on about the beer and chips guy, and the produce guy would definitely have more promise and be more of a foodie, especially if he knew the names of some of those crazy veggies we see there! Good luck! Keep us posted!!! Haha! I have totally had guys hit on me in the produce section…usually they ask for cooking tips ;)! love this post, this salad looks amazing :)! LOL! Thank you for the early morning laugh. :) Great post, and the recipe is delicious! Looks amazing. And you cracked me up. Added bonus. hahaha! love it! you can tell a lot by a man’s grocery shopping! gorgeous salad dear! I have seen so many savoury watermelon recipes, it’s nice to see one that treats it like the sweet it is! Looks great. Hope you meet Mr. Perfect in the grocery store while picking watermelons. I love your advice! Those small, urban markets are always my favorite. I’ll have to take your tips and follow that next man to the beer aisle! Great post! Love the salad. Love your rules for meeting a guy! This salad will hook him for sure! You’re too funny. How about taking a class? The watermelon looks great too! This salad looks so lovely! !